"Silent Dancer" - "What Can't Be Had" - "Gift of Life" - "Anymore"
"Troubled Times" - "Island of the Broken Hearts"* - "Mr. M"
The album, Empty Stage, was produced by Terri Wheston and Roy Rendahl. Engineered by Roy Rendahl except "Troubled Times," engineered by Dean Sim. 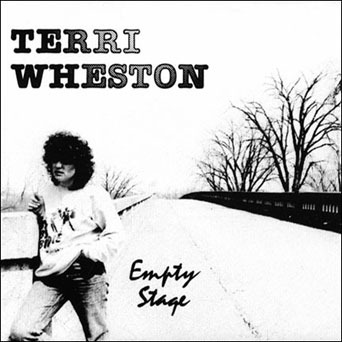 All songs were written by Terri Wheston except "Island of the Broken Hearts," written by Shawn Laehn. Recorded at M City Music, Minnesota City, Minnesota except "Troubled Times" recorded at Hardt's Music, Winona, Minnesota. Cover photo by Joe Smoot. Graphic design by Roy Rendahl (cover art is shown above). Contact Roy Rendahl at Trimordial Studio (formerly M City Music) email trimordial@thefaro.com or 702-340-6748 for more information about Terri. "Thanks to Shawn, Eric, Beckey, Myra, Joe, Dave, Pete, Amy, Steve, Eric, Og (Mr. M.) Mandino, and all who keep reminding me that the release of this recording is long overdue." "Special thanks to Roy for all your help, expertise, advise, magazine articles, time, etc. I couldn't have done it without you." "Roy is more than a recording engineer. He will help you get the best sound you can produce by putting you at ease, offering suggestions, and still letting you be in control of your recording." © 1989 - 2009 Terri Wheston & Trimordial Studio. All rights reserved. Audio recording studio & live sound reinforcement. Video production. Graphics, fine & commercial art, photography, & web site design.